A wardrobe box is a great way to store and move your clothes without having to just shove them in a bag or into moving boxes and get them wrinkled. With the wardrobe box, your clothes can stay on the hanger in the order you want without any hassles. 1. We are going to make a sturdy base first, so start with the box upside down. 2. Open the box to its natural rectangular shape then fold in the flaps: start with the front and back, and then fold in the sides. 3. Tape it together securely along the middle seam. Feel free to fortify the edges as well for extra durability. 4. Flip the box back over so it is right side up. Make sure the open flap is facing forward. 5. Fold in all 3 flaps at the top, starting with the sides. 6. 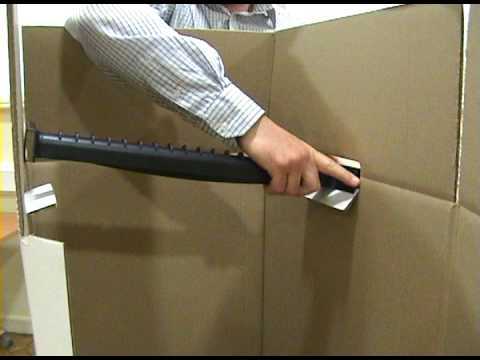 Find the little openings for your clothes rail on the sides of the box, near the top fold. There is one on each side of the box. Press them in. 7. Take your clothes rail and slide them into the holes carefully, one after the other. Don’t rip the box! 9. Grab your clothes, on the hanger, and place them into the box on the rail. The base is a great place to store a few pairs of shoes if you haven’t packed them already. 10. Once you’re done filling them, bring the loose part up and close the box, taping that middle seam with the tape gun. Make sure it is secure! 11. Grab a thick permanent marker and label the box so you know what is inside. It is as simple as that! If you need some of these wardrobe boxes in the Chicago area, contact us at Moving Boxes Now. We have plenty of these and other gently used moving boxes that we can deliver to you to make moving less stressful. Our blog is also a great place to find tips for making moving a much more efficient and pleasant experience.